Sometimes strangers can become friends. 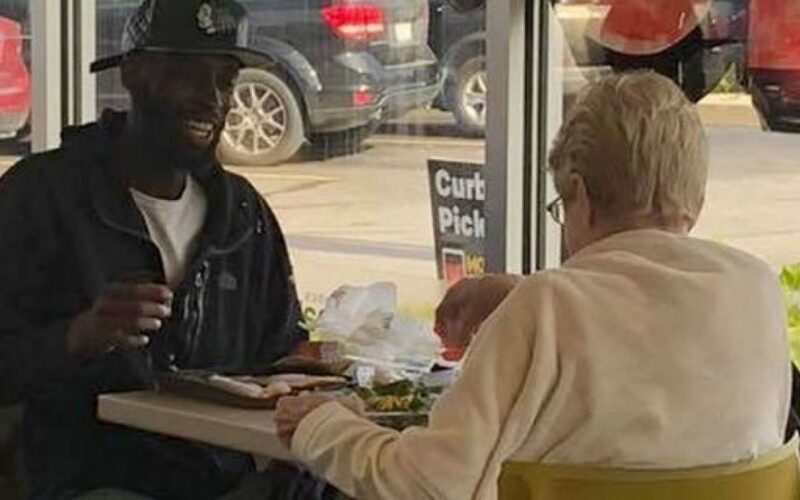 Last week, 28-year-old Eric Haralson went to McDonald’s in Noblesville, Indiana with the sole intention of eating breakfast alone. Little did he know that as soon as he sat down — he would obtain company. A 70-year-old woman named Jan approached Haralson in the restaurant and asked to join him for breakfast. Haralson responded with an enthusiastic yes. After she sat down, both of them spent the next 45 minutes engaging in conversations about life and appreciating each other’s company. Haralson spoke of his girlfriend and son and Jan spoke of going to church each Sunday and of her artist days. After breakfast and conversations, Haralson walked her to her car and exchanged phone numbers with the desire to have breakfast again. Later, Haralson saw a picture of him and Jan on Facebook. A school teacher named Amanda Marquell Craft snapped a photo of their exchange and published it to social media — praising Haralson for his compassion. The photo has been shared thousands of times. “Shout out to this guy! This elderly lady (seemed to be a little lonely) came up to him and asked if she could sit with him,” Craft wrote. David Leigh, a friend of Jan’s, commented on Haralson’s FB page also expressing his adoration for Haralson’s kindness. Haralson was glad to have shared a meal with her and was happy to have inspired many people, but he is most glad to have a new friend. Jan “just wanted some conversation,” according to Haralson, but now her request has sparked interest in many people to lend a helping hand, be kind people, and share their own stories of sitting down with strangers. Since last Thursday, Haralson had left Jan a voicemail asking to have breakfast with her again and expressing their newfound fame. He still has yet to reconnect with her.